RUIE + GRACE is a design and fabrication studio in Virginia specializing in event design, custom art installations, prop rentals, and styling services. Let us bring our signature style and aesthetic to your wedding or event. We will create a cohesive look for your entire event and execute all components of that design. In executing your design, we take care of every detail including your floral needs - from tabletop arrangements and bouquets to large scale floral installations. We are truly artists for hire- our capabilities as designers and fabricators are only limited by the ends of your imagination. We are always pushing the boundaries of what we can create. Allow us to add our style to your signage needs. 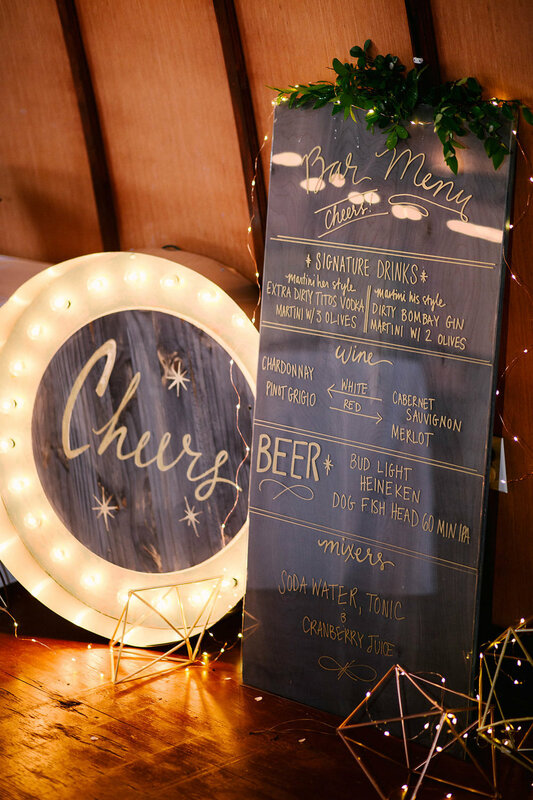 Menus, seating charts, welcome signs, script, serif, flourishes- whatever the job, we've got you covered. We are makers, builders, and fabricators. With our diverse experiences and dynamic skill sets we can transform the look of any commercial space. Pull from our curated collection of props for your next event - we have everything from found brass candlesticks and vintage china to RUIE + GRACE constructed backdrops and bars. Our cafe lights are the perfect addition to any event. Whether you're looking for a one-stop-shop for event design, a fabrication partner for custom installations, styling support for photo shoots, or an engaging storefront display for your business, RUIE + GRACE is excited to create something incredible for you. Bold colors, bright lights, flowers everywhere. A historic bed and breakfast gets a refined look. Clean lines, crisp colors, and cafe lights galore. A modern take on the farmhouse wedding. Hard vs. soft, geometrics, gold & grey.